Schematic procedure of the MethylFlash™ Urine N6-methyladenosine (m6A) Quantification Kit (Colorimetric). m6A standard was added into the assay wells at different concentrations and then measured with the MethylFlash™ Urine N6-methyladenosine (m6A) Quantification Kit (Colorimetric). m6A level is quantified from different volumes of human urine using the MethylFlash™ Urine N6-methyladenosine (m6A) Quantification Kit (Colorimetric). The level of m6A measured in human urine samples using this kit is comparable to that detected by HPLC method. A novel assay principle allows high sensitivity to be achieved. The detection limit can be as low as 0.01 ng/assay well. 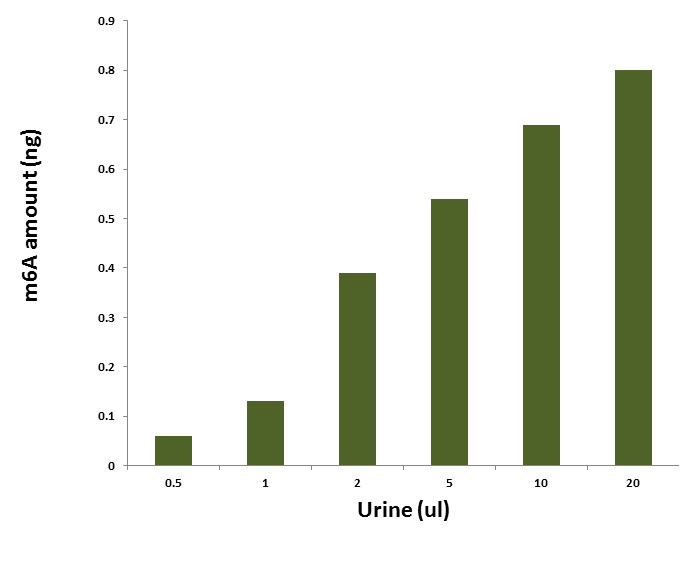 Low input range of urine for each assay with a volume of 1 to 20 µl and an optimal volume of 5 µl. Optimized antibody and enhancer solutions allow for high specificity to m6A, without cross-reactivity to unmethylated adenosine. Negative control and positive standard are included, which are suitable for quantification of m6A in free form and m6A contained in DNA/RNA fragments from different urine samples. Nucleobase m6A, a modified form of adenosine converted by adenosine methyltransferases is widespread in different cellular RNAs and also found in DNA. The biological importance of DNA/RNA m6A-methylation as a major epigenetic modification in phenotype and gene expression has been recognized widely. m6A plays crucial roles in regulating DNA replication, DNA damage, RNA splicing, transposition, transcription, and cellular defense. In humans, the m6A modification is probably catalyzed by a methyltransferase complex METTL3/METTL14 and removed by the α-ketoglutarate (α-KG)- and Fe2+-dependent dioxygenases such as FTO, ALKBH5 and TET-like enzymes. It was shown that METTL3 and α-KG /Fe2+-dependent dioxygenases play important roles in many biological processes, ranging from development and metabolism to fertility. Urinary excretion of m6A is an indication of the whole body turnover or the degradation of DNA/RNA, especially tRNA. The urinary m6A level can be changed with a change of the bodies’ turnover of m6A DNA/RNA or alteration of cellular DNA/RNA m6A status. A number of studies have indicated that m6A excreted in urine has the potential to act as a cancer biomarker. For example, an elevated level of urinary m6A was observed in colorectal cancer patients with active disease states. 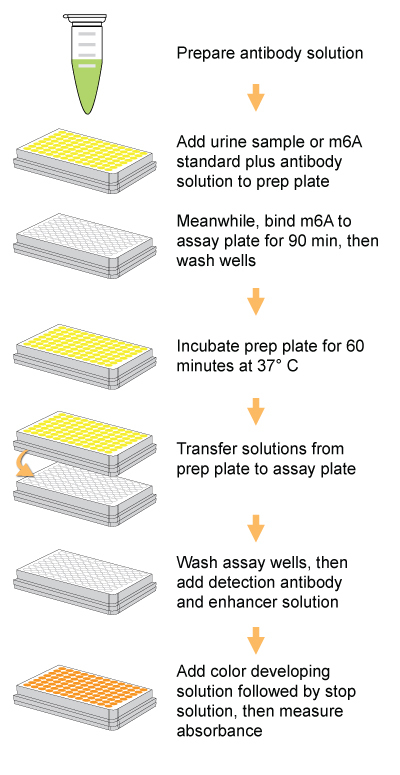 In this ELISA-like inhibitory competitive immunoassay, urine samples and the m6A standard are first incubated with a m6A antibody solution and then transferred to strip wells coated with m6A polynucleotide. The well is washed to remove any unbound reagents after incubation and then a detection antibody is added to generate a signal that can be measured colorimetrically by reading the absorbance in a microplate spectrophotometer. 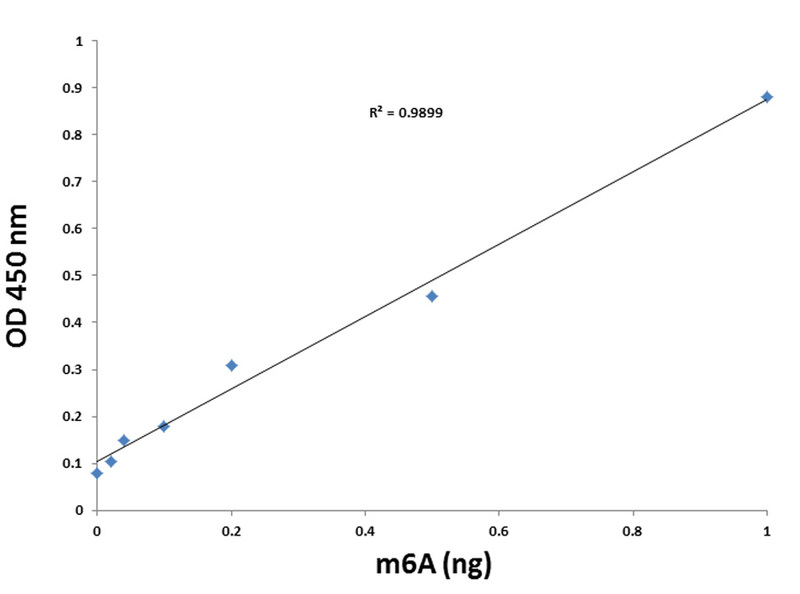 Because m6A in the urine sample inhibits the binding of m6A antibody to m6A coated on the well, higher concentrations of m6A in the urine sample lead to a reduced binding of the antibody to the m6A on the well. Therefore the signal or OD intensity measured from the well will be inversely proportional to the amount of m6A in the urine sample and the amount of m6A in the urine sample can be quantified by a comparison with a predetermined m6A standard. The volume of urine for each assay can be between 1 and 20 µl. For optimal quantification, the input urine volume should be 5 µl.